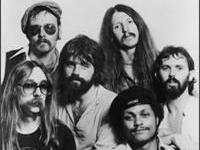 Keith Knudsen replaced Hossack as the group’s second drummer for 1974′s What Were Once Vices Are Now Habits, which launched their first number one single, “Black Water,” and featured heavy contributions from former Steely Dan member Jeff “Skunk” Baxter. Baxter officially joined the Doobie Brothers for 1975′s Stampede. Prior to the album’s spring release, Johnston was hospitalized with a stomach ailment and was replaced for the supporting tour by keyboardist/vocalist Michael McDonald, who had also worked with Steely Dan. Although it peaked at number four, Stampede wasn’t as commercially successful as its three predecessors, and the group decided to let McDonald and Baxter, who were now official Doobies, revamp the band’s light country-rock and boogie. The new sound was showcased on 1976′s Takin’ It to the Streets, a collection of light funk and jazzy pop that resulted in a platinum album. Later that year, the group released the hits compilation The Best of the Doobies. In 1977, the group released Livin’ on the Fault Line, which was successful without producing any big hits. Johnston left the band after the album’s release to pursue an unsuccessful solo career. Following his departure, the Doobies released their most successful album, Minute by Minute (1978), which spent five weeks at number one on the strength of the number one single “What a Fool Believes.” Hartman and Baxter left the group after the album’s supporting tour, leaving the Doobie Brothers as McDonald’s backing band. Following a year of audition, the Doobies hired ex-Clover guitarist John McFee, session drummer Chet McCracken, and former Moby Grape saxophonist Cornelius Bumpus and released One Step Closer (1980), a platinum album that produced the Top Ten hit “Real Love.” During the tour for One Step Closer, McCracken was replaced by Andy Newmark. Early in 1982, the Doobie Brothers announced they were breaking up after a farewell tour, which was documented on the 1983 live album Farewell Tour. After the band’s split, McDonald pursued a successful solo career, while Simmons released one unsuccessful solo record. In 1987, the Doobies reunited for a concert at the Hollywood Bowl, which quickly became a brief reunion tour; McDonald declined to participate in the tour.